The Aggies (11-6, 4-0 WAC) now make it seven-straight wins, 11 wins in 12 games and begin Western Athletic Conference play 4-0 for the first time since joining the conference. The last time NM State began conference play 4-0 was in 1990 when the then Roadrunners began High Country Conference play 6-0. NM State matched its season high field-goal percentage of 50 percent after sinking half of its shots from the floor (28-56). The Aggies also shot 43.8 percent from 3-point range (7-16) and hit 11 of their 13 free throws for an 84.6 percentage, the second-highest of the season. NM State also continued its high-pressure defensive assault as the ‘Lopes finished with 22 total turnovers, the sixth-consecutive game and 13th overall the Aggies have forced at least 20 turnovers. NM State also had 15 steals on the night. "The kids played hard, it's always good to win a tough road game," Aggie head coach Mark Trakh said. "We didn't play great, we didn't play poor, but anytime you win by 12 it's a good night. But we can still get better, there's a couple of girls that can get better." Reigning WAC Player of the Week Shanice Davis remained hot with a game-high 24 points. She has finished in double-figures in all four conference games for the Aggies. Davis also dished out seven assists. Brianna Freeman also kept her hot streak alive in the paint. The sophomore forward finished with 15 points and almost collected her third double-double of the season after finishing with nine rebounds to lead the team. Fellow sophomore Moriah Mack added 12 points and five boards while junior Sasha Weber finished with nine points and tied her career best with five steals. Weber got things started for the Aggies with a 3-pointer 22 seconds into the game. But GCU answered with five-straight points to take a 5-3 lead. Unfortunately for the home team, it would be their largest lead and one of only three early leads it would hold. The last lead for the ‘Lopes would be at 11-10 with 16:21 left in the first half. NM State would mark 10 of the next 12 points to take a 20-13 lead and force a GCU timeout with 13:37 left in half number one. The ‘Lopes would cut the Aggie lead to three, first at 20-17, then at 23-20 and finally at 26-23 with 8:29 left in the opening frame. From that point on, however, the NM State defense would only allow two more GCU points in the half. The Aggies finished the final eight and a half minutes of the first half on a 14-2 run that started with nine-straight points. The run ended with another Weber 3-pointer and a bucket by Davis, both with under a minute left in the half, that gave the visitors a 40-25 lead heading into the locker room. NM State shot 50 percent from the field (16-32) and 46.2 percent from beyond the arc (6-13) in half number one and also sank its only two free throws of the half. The Aggie lead was never really threatened in the final frame as it never got to single digits. Consecutive Davis’ buckets gave NM State a 16-point lead, 50-34, with just over 15 minutes to play. Davis would continue to challenge the GCU defense by driving to the hoop throughout the second half, either scoring or getting fouled. She marked 14 of her 24 points in the second half and finished the game 5-of-6 from the charity stripe. At one point midway through the final half, Davis would sink seven-straight points for the Aggies. With 3:18 left, two Tamera William free throws ballooned the NM State lead to the biggest of the game, an 18-point, 72-54 lead. The ‘Lopes would cut into the lead in garbage time at the end of the game, but the Aggie lead and win was never really in doubt in the final minutes. The Aggies now turn their attention to Saturday’s matchup with Utah Valley in Orem, Utah. 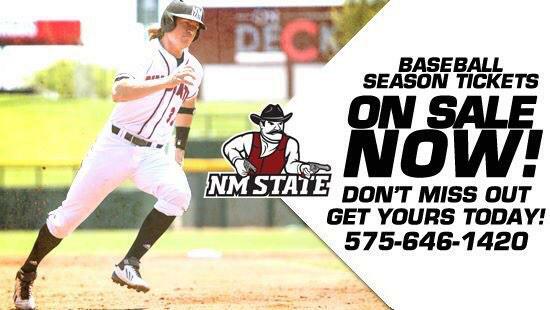 NM State will be looking for a 5-0 WAC start and eight in a row when it faces the Wolverines beginning at 3 p.m. (MT). Saturday’s game will air live over Las Cruces radio with Adam Young on ‘The Ticket’ AM 570.